Want Creative Ideas regarding your Living Room furniture? Professionals at Aarsun Woods to the rescue. We provide a range of products with uniqueness instilled in each design. The designs can be unique to your tastes and finishing as per your desire. We can help you choose the right product, design, material and finish which actually will look good in your home. 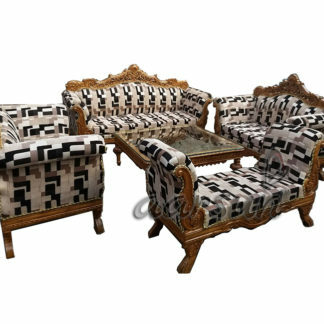 Grab this Wooden Sofa Set traditionally handcrafted by our craftsmen with finesse. The units are designed specifically for ones with a need of something fine and royal. The wooden Sofa is heavily handcrafted in spectacular bunch of rose-buds stacked together at the middle-head and floral carvings at the supporting arms and legs. The sofa set is made from Teak Wood (Sagwan) with natural wood finish. The unit looks fantastic in different lighting conditions. Moreover, as each log of wood is unique in texture and has its own color, the final shade achieved is completely unique. Watch all your favorite shows or have a splendid social gathering of friends and family in your living room with a comfortable set of sofa offered by Aarsun Woods. Aarsun Woods have been providing handmade furniture in India as well as abroad keeping in mind the exact requirements of the clients. We have a range of products that are highly customizable: be it large living room furniture sets, dining room sets and Temples or small wooden tools and accessories for kitchen. Contact us at +91-8192999135 / +91-8266888634 for details regarding delivery time-frames and manufacturing time.